Apple Watch With Custom Red Sport Band, Folding UK Plug Spotted in New Photos. British cyclist and former professional rugby player Will Carling has shared a pair of newphotos on Twitter that appear to reveal two unreleased Apple products. 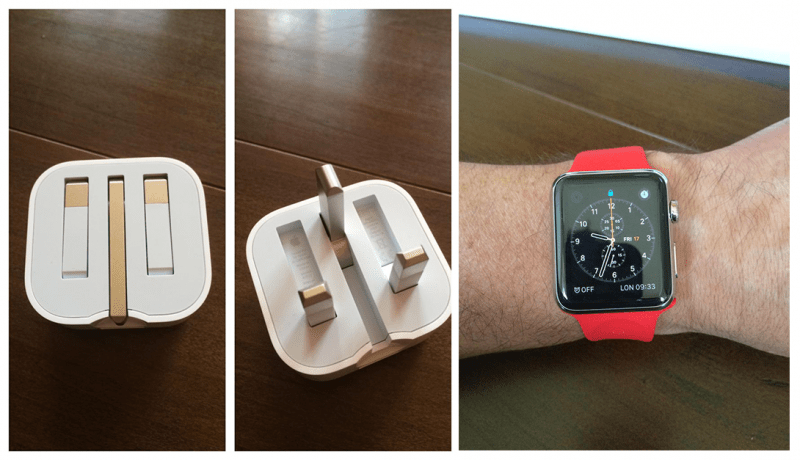 The first photo shows a stainless steel Apple Watch with what looks like a custom red sport band, while the second photo provides a side-by-side look at an Apple charger with a unique folding plug design for use in the United Kingdom. Carling claims that Apple design chief Jony Ive provided him with the folding charger, which could be the official charger for the Apple Watch in the United Kingdom, and it is likely that is who gifted him the Apple Watch with a custom red sport band as well. Ive grew up in England and is known to be a rugby fan, and Carling was the former captain of England’s national rugby team from 1988 to 1996. It is possible that the photo is actually of an Apple Watch with the similar looking pink sport band, although the lighting in the shot gives the band more of a red appearance and Carling mentions that he prefers “the red band” on Twitter. Apple has given a custom watch to at least one other iconic figure, with designer Karl Lagerfeld spotted wearing an Apple Watch with gold link bracelet earlier this week. This entry was posted in iRumors and tagged (RED), Apple Watch, irumors, iRumorsnow. Bookmark the permalink.